by Pastor Jack Hyles, Th.D. 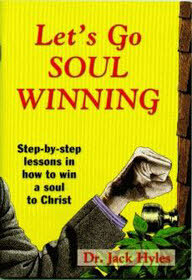 Here are simple step-by-step lessons in exactly how to lead a soul to Christ. They have been given in great soul-winning conferences all over America and have made many average Christians into amazingly effective soul winners. The lessons are reproduced here exactly as given in one of these conferences. Since the printed publication of this book in 1962, First Baptist Church of Hammond, Indiana has seen tremendous growth under the leadership of Dr. Hyles. The church now averages well over 20,000 in attendance every Sunday. This church has seen more people saved than any church in the nation. Several Sundays they have seen over 3,000 walk the aisle accepting Jesus Christ as Saviour. Dr. Hyles is the founder and chancellor of Hyles-Anderson College, dedicated to preparing local church pastors and workers. The College has over 500 graduates now pastoring churches all over the world, and more than 2,000 graduates serving God full time. His annual Pastor’s School attracts several thousand preachers and Christian workers from all over the nation. His annual Youth Conference attracts over 7,000 teenagers from almost every state.